114 days ago I fell and broke my right wrist. It was a very bad break, which warranted a pretty big surgery. Two plates and 15 screws later, I was sent to this place two weeks after surgery. And this has been my full time job for the last 14 weeks. in the hot box :-) My hand is warmed with the swirling of crushed corn stalks. and some of the toys I get to play with. Yes friends and neighbors, the Happy Cottage Quilter has been wielding the Olfa Rotary Cutter and making those all important cuts. A baby quilt in the making!!! Is it time to party yet??? It seems I have taken a bad cold, so today I'm doing some R&R. 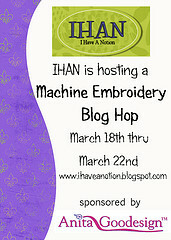 I wanted to give a shout out for my good friend Kelly Jackson from IHAN who is hosting a Blog Hop Party! I do not have an embroidery machine, but I know many of you do, so won't you join the fun!! There are lots of cool hints to glean. May your day be filled with sunshine, flowers and butterflies :-) For all of you still under snow, know that those days ARE coming! Beat the Winter Blues Winner! Winner, winner!! Of the Beat the Winter Blues Giveaway is Chiska!! Please send me your mailing information. 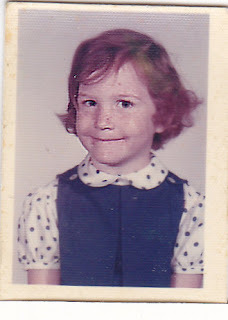 Please let me hear from you by Thursday, or I will pick a new winner. I thought I would share National Quilting Day by showing you pictures from our trip last week to the Sewing Expo. Lots of pretty quilts on display that have been touring the US. The show was held at the Lakeland Convention Center, and let me tell you, the place was packed! We could not get into some of the vendors booths when we first arrived. But after our second go around things thinned out - a little. It was a very nice show, but boy were we tired when we got done. Enjoy your Quilting Day!! Celebrate by QUILTING!!! Would you like to do something nice for a special friend of ours?? Hop over to Kelly's blog and read about sending her Mom lots of pretty Happy Day cards to cheer her up while she's in the hospital. After I shared my attempt at a new hobby, using beads for jewelry from a previous project, a couple of people asked if I had a tutorial on making the Beaded Pins. I had not, as it was just something that I did on my own. It may not be the rightest way to make the pins, but I can show you what I did. When I started making the beaded pins, I searched for the longest pins I could find. This proved to be quite a task. I started out with a #20 size pin, but found it was not quite long enough. So I kept looking and finally found these Extra long Satin Pins which are #21. I bought a variety of beads from JoAnn's and also from WalMart. Walmart carries $1 bags of assorted beads, which fit the bill just fine. Now the fun part. I use 527 glue, but I think you can use any good glue that will keep a good hold (not a school type glue). Dip the head of the pin into the glue, either right from the glue bottle, or pour out a little on wax paper and dredge the pin head into the glue. Then layer the beads in any order that you like. Allow to dry by laying the pin on it's side. You can make any number of combinations to make pretty beaded pins. This was a very fun project to make, and is wide open to your own creative ideas. 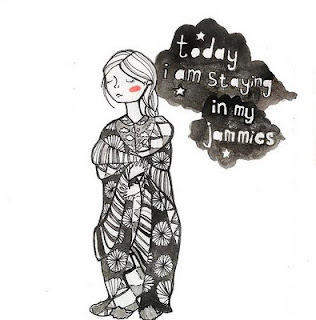 Have a great day of creativity. Whether it's quilting or crafting! Welcome!! Today The Quilting Gallery is beating the Winter Blues. SO are you ready to visit all the blogs that are giving away some fun goodies?? Today I am giving away a copy of Material Obsession 2! Traditional quilts with a modern flair. Here is a little snapshot of what's in store. If you are new to my blog, I am very happy to meet you. If you are an old friend, it's so good that you have come by to visit. If you would like this amazing quilt book to go home with you, all you need to do is leave a comment on this post telling me where you are from. I love meeting friends from all over the world, and it's so exciting to see where my readers are writing from. Giveaway will be open until St. Patrick's Day at which time I will close the comments. Winner will be contacted by email, so please BE SURE that you have a way to be contacted. If you are a NO-REPLY blogger, leave your email address. If I cannot contact you, I will choose another winner. Thanks Quilting Gallery for hosting the Blog Hop party! And thank you for stopping by! I hope you will come back soon. With many limitations on using a rotary cutter, and doing any quilting, I thought I would try a little project that's been on my mind. Last year I bought beads and made some decorated pins. I ended up having quite an assortment of beads left over. I've wanted to try my hand at making a little bit of jewelery. So I bought the stretchy string and gave it a go. I don't think I will be opening an etsy shop anytime soon :-) but it was fun to use my hands putting these bracelets together. I even tried to incorporate a charm that was given to me recently. 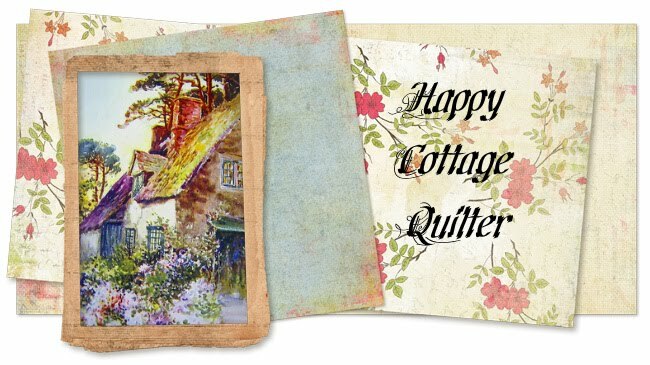 I hope you are having a Happy Quilting day!